Saturday, August 13, 10 a.m. – 5 p.m. In many ways, Mozart Dane is your typical artist -- he can only paint when the mood strikes him, prefers to work in his own studio, and requires quiet to be creative. But Mozart, or “Mo” as he is known to his friends, differs from other artists in one important way -- he is a dog. As the “Featured Artist” in this year’s 28th Annual Art on the Lawn in Yellow Springs, Mo will personally present his abstract masterpieces for sale to the public. All sales will benefit his favorite charity, Harlequin Haven Great Dane Rescue, www.hhdane.org, the group that rescued him, and for whom he has become a dedicated “spokesdog” against puppy mills, pet stores, and homeless dogs. Mozart will join around 100 other juried artists from Ohio and beyond -- jewelers, painters, ceramists, photographers, fabric artists, woodworkers, metalworkers, calligraphers, and more -- under the shade trees of Mills Lawn Elementary, in the heart of beautiful Yellow Springs. Mo’s paintings, along with artwork from human artists, will also be featured in Village Artisan’s “Dog Daze of Summer” show for the entire month of August. The public is invited to a reception during the village-wide Third Friday Fling in the Springs, Friday, August 19, 6-9 p.m. (Mo will try to attend, but is not sure of his schedule.) Village Artisans is located at 100 Corry Street (corner of Dayton and Corry Streets), Yellow Springs. 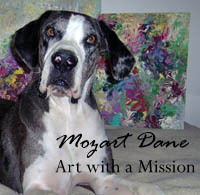 To view some of Mo’s paintings and read more about him and his causes, go to www.hhdane.org/mozart. To learn more about Village Artisans, go to www.shopvillageartisans.com or visit us on Facebook.